The success of a digital system that allows CDs to be scratched and mixed in the same way as 12-inch records could mean the death end of DJs using vinyl, a top DJ and record producer has said. The system, called the CDJ-1000 and produced by technology company Pioneer, has been designed to replicate as much as possible a traditional vinyl deck, but taking advantage of modern digital technology. The decks, which have already won a number of awards, have been given great approval by Erick Morillo, boss of Subliminal records and one of the most influential DJs in the world. "I'm letting technology take over," Mr Morillo told BBC World Service's The Music Biz programme. "With the introduction of the CDJ-1000 I feel like there's a whole new way of DJing these days." The key to the system - which resembles a small version of a vinyl deck - is a grooved, touch-sensitive jog wheel, which allows records to be stopped and scratched at any time. Until now, the inability to do this was one of the key reasons DJs had shunned performing with CD decks. Additionally, the system has an internal memory that can remember cue and loop points, and allows tracks to be remixed live. "When I'm DJing with vinyl, I'm bored now," Mr Morillo said. "With CDJs you can loop the records at whatever point you want. "I take my filters and I'm remixing records on the fly." 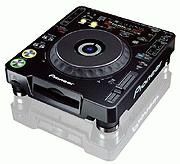 Pioneer say that they developed the system with DJs to try and tackle the problems encountered when using traditional CD players. "What we did here was look at all the objections that DJs had against using our existing range of DJ CD players, and basically overcome them," Pioneer spokesman Martin Docherty told The Music Biz. "That's why this product has been so successful, and it's now the industry standard across the world." The system also has a memory card that recalls edit points for tracks, meaning that a DJ can travel with only the card and their CDs. The card is inserted into another CDJ-1000 deck and the player will recognise all cue and loop points. "Many DJs are still using vinyl, but they're now using vinyl alongside CD, simply because of the extra performance value," Mr Doherty added. "DJing is becoming very competitive, and DJs are now looking for alternative pieces of hardware to enhance their set and give them the edge over the competition." Mr Morillo confirmed that he and his record label were abandoning vinyl in favour of the new technology. "It's funny because I was a spokesman for vinyl. About two years ago I said vinyl will never go away, vinyl this, vinyl that," he said. "But [the decks] really do feel like vinyl, and you can put as big a show with the CDJ-1000 as you can do with turntables. "So now, I'll probably be the person that is going to spearhead this whole changeover to CDs and being a vinyl label, it's kind of weird to hear me say that. "With each vinyl release, we're going to include a CD with all the mixes as well, because that's where it's going." 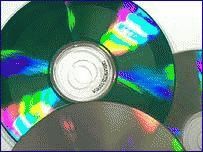 Mr Morillo conceded that the complaint most often levelled against CDs by vinyl enthusiasts - that the sound is too clinical and lacks warmth - remained true. "The specialists will argue there's a certain sound you're missing, and absolutely, they're right," he noted. "But the convenience far outweighs the little sound that you may be missing."